This song rekindles memories of the fiery wave of the black consciousness movement that swept across the African diaspora from 1960s through to the ’80s. The Rift Valley Brothers band’s lyrics are seemingly a clarion call imploring local Kenyans to come to terms with their rich African roots and home-grown heroes. These were likely inspired and penned in praise of Kenya’s liberation struggle and key Mau Mau frontline freedom fighters. Several unsung and long forgotten ‘bush’ generals are saluted for their sweat, gallantry and bloodshed. But the underlying message is undeniably emphatic on the pressing need (especially for the younger generation) to embrace selfconsciousness and pride in their African heritage. Happy summer! We are have been working hard to update the site to be more mobile friendly and will keep adding more vintage stock throughout the year! Keep coming back in! 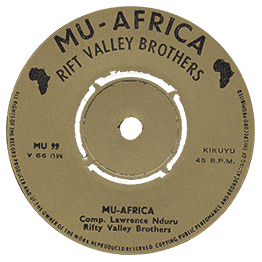 The intermingling of nifty guitar riffs on this blend of Congolese and Kenyan musical influences is deeply original and typical of a very unsung musical outfit that seemed to have become largely forgotten over the years. 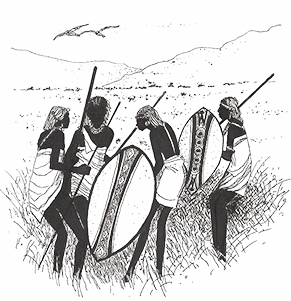 ‘Let’s sing, dance and party on to our music’ (ngoma yetu)’ the lyric goes. 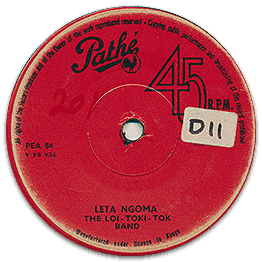 This deep track is indicative of the multi-layered repertoire of The Loi Toki Tok – the resident band at the uptown Arcadia Club (now the Florida Night Club) along Koinange Street in Nairobi. This track is featured on Kenya Special by Soundway records, compiled by Miles Cleret, Fredrik Lavik and Rickard Masip. It was recently repressed and can be bought here on all formats!